Square Enix is bringing Final Fantasy V to the PlayStation Network with a little bit of new content. Square Enix's Final Fantasy V never made it out of Japan on its original platform (the Super Nintendo). In the West, Square released Final Fantasy IV as Final Fantasy II (because it didn't localize the NES's actual Final Fantasy II and Final Fantasy III), and then skipped Final Fantasy V to release Final Fantasy VI as Final Fantasy III. It was a whole thing. Thankfully, Square Enix is now putting together a brand new release of Final Fantasy V for the PlayStation Network, and even throwing in some new content. Square Enix has announced that Final Fantasy V is coming to the PlayStation Network for the PSP and PS3 with all-new cinematic sequences. It'll also feature, well, nothing else new. Sorry. Something is better than nothing, I suppose. Later, Square did release Final Fantasy V in the West for the Game Boy Advance and in the PS1's Final Fantasy Anthology. Anyone that missed these titles now have something else to look forward to that will (probably) never go out of print. Final Fantasy V is an interesting game. It doesn't have the storytelling strength of the memorable Final Fantasy IV or the amazing Final Fantasy VI, but it does come with a pretty cool job system. 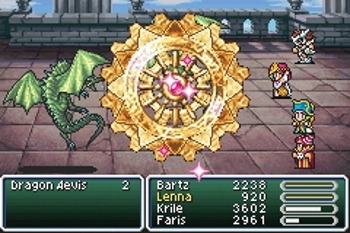 While a switchable job system was first seen in Final Fantasy III (NES version), it didn't hit its stride until Final Fantasy V. Players could not only change their characters' classes, but transfer skills from previously held classes to new ones to create hybrid types (i.e. healing knights). While the job system might be one of the more interesting components of Final Fantasy V, it also features some memorable tunes and the story isn't that bad, it just doesn't compare to other Final Fantasy efforts. At $10 or so ($5 in our dreams), it'll be worth a trip down job system memory lane. Square Enix didn't say when it plans to release Final Fantasy V on the PSN, just that it's "in development."